As we are enjoying our Thanksgiving leftovers, some of us are thinking about the next set of issues over which the Left will spontaneously combust. Funny how it’s often timed perfectly for the next political fight and they are relatively quiet until people start paying attention after the New Year. When Democrats gain control of the house in January, they will be fighting harder than ever to convince us that law-abiding citizens shouldn’t be trusted to have guns to defend themselves. 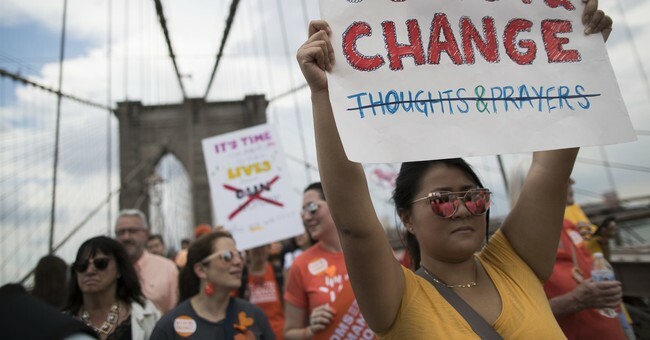 Not long ago, they balked bitterly at the accusation that their real goal was to repeal the Second Amendment. Now, many have finally started to admit that this is precisely what they had in mind all along. Good for them. Better for us. They are easier to beat when they tell the truth. Unfortunately, that’s never very often. Conservatives have an excellent argument in favor of the Second Amendment by proclaiming that “it takes a good guy with a gun to stop a bad guy with a gun.” Unfortunately, it makes no sense to Leftists and it’s instructive to examine why. The Left has been working overtime to erase the difference between good guys and bad guys. To them, we are all just as capable of being Charles Manson as we are Mother Theresa. They claim that individual choice and personal responsibility has nothing to do with who is good and who is evil. Maybe that’s why they can always be counted upon to come to the defense of ruthless, hardened criminals. They have for decades perpetuated the idea that criminals are victims. Now, they've moved on to painting law-abiding citizens are criminals. This speeds us on the road to being all the same. Think of it as the redistribution of personal responsibility. If you are white, male, Christian, or God-forbid, a Republican, you are already guilty without having done anything at all. If you dare to own a gun, you are de facto guilty. It doesn’t matter what choices you make. The Left does not consider this to be prejudice as long as the right people are pre-judged. They argue that they can perfect the world and our behavior by creating a “correct” society which they will define for us. We are merely spokes in their socialist utopian wheel. Whether it’s about women, guns, taxes, or trade, positions on the Left are built on the same collectivist bigotry. No one ever seems to hold them accountable for not counting themselves among the groups into which they have categorized everyone else. That’s how Michael Moore is able to rail about stupid white men even though he is one. That level of arrogance is reserved only for the power elite. This crazy-making, upside down thinking makes most conservatives either shake their heads or giggle. “How can anybody actually believe that?” Possibly for the same reasons the Left believes that all women should be believed because they are women; that you can “identify” as anything you want but you shouldn’t engage in "cultural appropriation,” and that eating Chicken Cacciatore constitutes a holocaust on your plate. Still, the Left is losing some of their mojo. It’s tough to try to convince people that they shouldn’t be able to defend themselves when Leftist politicians refuse to condemn the bullying and threatening behavior of their own base. In some cases, they have actually incited that behavior. It is harder than ever to convince somebody like Tucker Carlson’s wife to give up her right to defend herself since she was recently visited at her home by “Anti-Fascist” Fascists chanting “We know where you sleep”. People like this especially love the idea of repealing the Second Amendment. Criminals always like it better when the people they’re attacking can’t fight back. So what sort of Second Amendment argument could work with Leftists? I suggest we do a little “cultural appropriation” of our own. Let’s resurrect some of the trends that liberals themselves made famous in the sixties. I don’t think they’ll mind, since they aren’t using them anymore. Liberals used to be champions of free speech. They made it cool to be a non-conformist and to “do your own thing.” They put individualism in fashion even though they all dressed and spoke alike! Before we can make the argument that "a good guy with a gun can stop a bad guy with a gun," our opponents will have to recognize that there are indeed good guys and bad guys. Individual choices and personal accountability is what makes much of the difference between them.